Ab Training has evolved in the past years. Now, many physical therapists and personal trainers now recommend direct ab exercises that tend to isolate the abdominal muscles an indirect ab exercises that require the abs to stabilize the spine while other parts of the body are moving. Often indirect abdominal training is referred to as core training. The philosophy of core training is that all movements are initiated from your center or core, so in order to move efficiently you must have a stable core. When you move efficiently, you will have less risk of injury and improve sports performance. The 2 advanced ab exercises below will train your abdominal muscles for stability and give you a good ab and core workout. Starting Position: Begin in a plank position with your elbows and feet at shoulders width apart. Form: Use the drawing-in maneuver to engage your abdominals and keep your spine and pelvis stable. After you engage the abdominal muscles, slowly lift one arm and the opposite leg of the floor. Hold your arm and leg off the floor for 5-30 seconds and then repeat on the other side. Personal Trainer Tips: You can perform this exercise in 2 ways. You can hold for 5-30 on each side or you can alternate sides holding for 2-5 seconds on each side. If you use the alternating technique aim for 3-5 repetitions per side for each set. If this exercise is too difficult, begin by mastering the regular plank exercise and then move on to the 1 leg plank. Starting Position: Begin from a quadruped position (hands and knees), and extend your opposite arm and leg so that they are in-line with your body. Form: Use the drawing-in maneuver to engage your abdominals and keep your spine and pelvis stable. After you engage the abdominals, slowly bring your elbow and knee towards each other-- touching them if possible. Hold for a brief second and then return to the starting position. Personal Trainer Tips: The goal of this exercise is not to simply lift your arms and legs and touch your elbow to your knee. The goal is to remain as stable and solid through the core and pelvis and keep your spine from moving too much. You can make this exercise more advanced by performing it from the full plank position versus the quadruped position. In the full plank version simply begin on your hands and feet versus your hands and your knees. There are many ways to approach ab training. You can focus directly on your abdominal muscles with exercises such as ab crunches or you can focus on indirect exercises that challenge your abdominals and other core muscles, like the plank. These exercises can be challenging, so go slowly and build up your strength. If you have difficulty with these ab exercises, visit the Picture Directory of Ab Exercises to get more ideas for things you can include in your ab training routine. Remember to have fun when you workout and challenge yourself periodically to master new exercises. Personal Training and Coaching to take your fitness and health to the "Next Level". 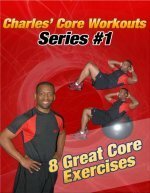 Promoting physical fitness as a lifestyle from youth to adult.